E-ink is best known for their ereader screens, but lately they have been making a strong push into other markets. For example, they are now providing screens for a number of DIY and development kits from Freescale, AdaFruit, SEEED, SparkFun, and more. I happened across a few of the kits in the E-ink booth at SID Display Week, and that inspired me to go look for more. The following post includes a mix of kits with segmented displays and graphic displays. Some of these kits are project-based while others are development kits. BTW, if you know of a kit not mentioned here, please mention it in a comment. Update (26 April 2015): a couple new models have come on to the market since I wrote this post. This recent (April 2015) addition has a 4.3" screen and a 6-wire serial port. It's designed to work with Arduino and other boards. 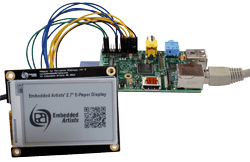 Atmel has partnered with Pervasive Display to produce a kit with 1.44", 2", and 2.7" E-ink screens and a controller board. The EPD Xplained Pro kit costs $72. First up is an ePaper Kit from Embedded Artists. This kit takes a 2.7" (264x176) E-ink screen from Pervasive Displays and mounts it on a board that leaves all the pins readily accessible. This kit can work with Raspberry Pi, Arduino, and more. It's listed for 29 euros. This DIY instigator sells a trio of kits that use the rePaper project board. Each kit comes with a single screen and a cable that is intended to make it easier to connect this kit to an Arduino or other project boards. The first kit has a 2" (200x96) E-ink screen and currently listed at $35 for a single kit. 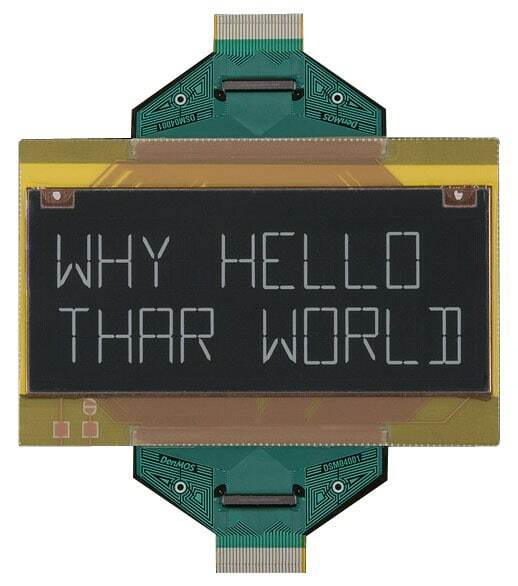 AdaFruit is also selling a second kit with a 2.7" (264x176) E-ink screen. This one costs $40. 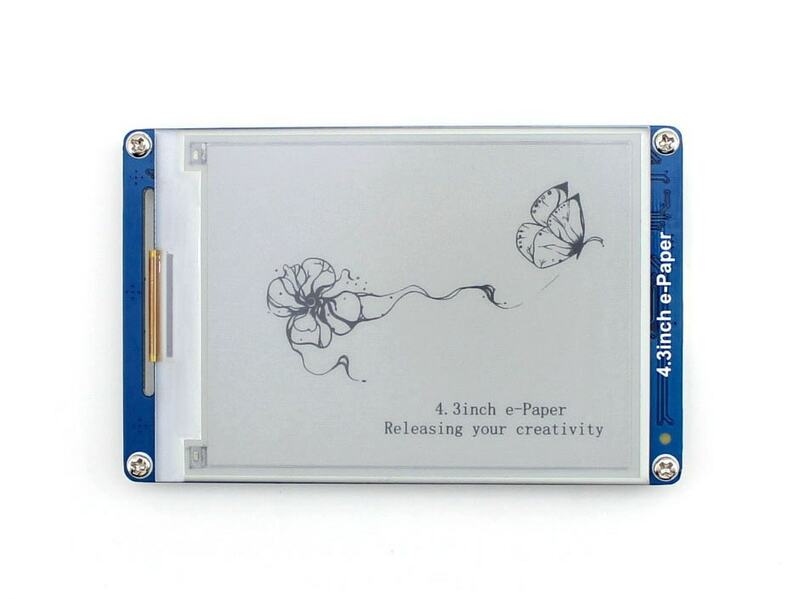 And if you want a smaller size, you can get a kit with a 1.44" (128x96) E-ink screen for $33. Here is a minimally functional but rather expensive option from Sparkfun. This $25 display, when combined with a $15 breakout board and a CPU board, will offer you the ability to show 2 shows of 10 characters. That's not much to work with, but it could be useful for certain limited function projects. And as you can see from this demo video shot in 2011, the display is about 3" across so it should be quite readable. That Sparkfun unit can't do much, but luckily this next one can. 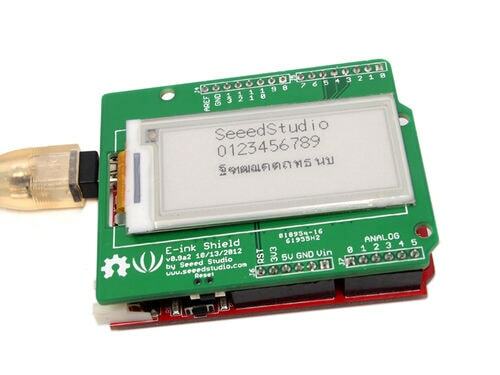 Earlier this year SEEED released a screen unit which is designed to plug into an Arduino board. They call it a display shield, and it gets the name because it takes up all the ports on the Arduino board. It costs $50 and is built around a 2.1" E-ink screen with a resolution of 172 by 72. E-ink has been making their own kits for a while now, and you can now buy a basic one via DigiKey. The one at right costs $70, and it comes with 2 segmented displays. 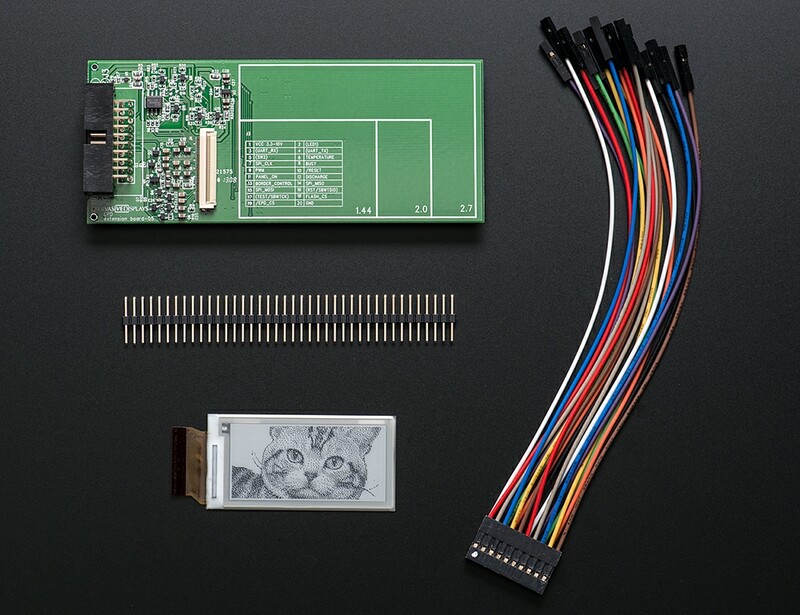 This is a development kit, not a DIY kit, so it is intended to introduce a hardware developer to E-ink's screen tech. 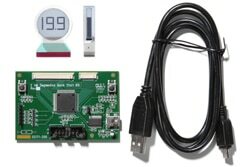 This kit includes a control board and plugs into the USB port of a laptop for easier programming; it doesn't require any other hardware. Here's a kit that I just happened across today. It combines a segmented E-ink display with a control board. 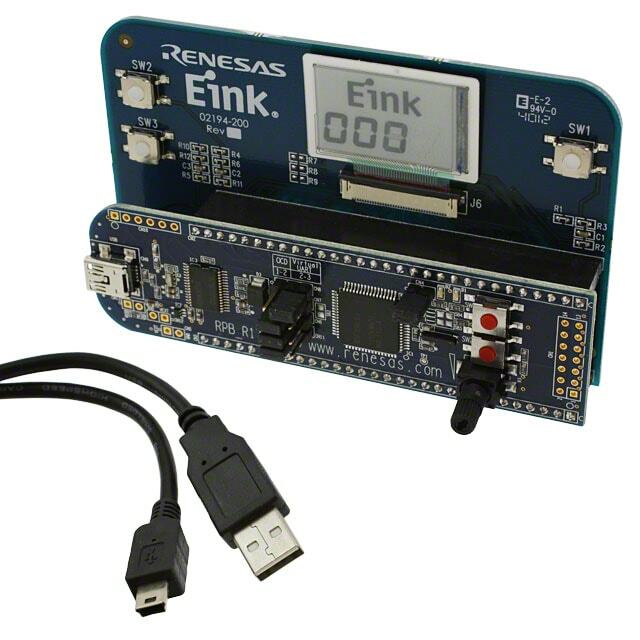 It costs $49, and is available now from Renesas, Fact sheets and other info can be had from DigiKey. If all the kits I have shown you so far are simply too small for your project, then you might want to go look up Freescale. They have been making E-ink demo kits for a few years now. I can't find purchasing info on their website, but I did happen across their latest kit in the E-ink booth at SID Display Week. It had a 6" E-ink screen and used one of Freescale's latest CPUs. That is probably more power than needed for most projects but then again I am not a hardware engineer. And just to be clear, the Freescale kits are intended more for prospective Freescale customers who are interesting in building their own hardware. These aren't really DIY kits, but I include them here to show one rather extreme option. Do these displays maintain their message with no power ? What range of temperatures can they operate in ? An E-ink screen will hold its content after it loses power, yes. The Freescale one is $698, which is a bit expensive. But it does look very nice. Where can i buy get the Freescale from? Is there DIY Low Cost Kit for Home Automation Dashboard ? Would be great to mix a display with a Pi Zero. Well, there are screen kits designed to be mounted on or plugged into the Pi itself. But I do not know of a wireless kit, no. I make a 2.7″ e-paper display board for the Raspberry Pi, which works with the A+, B+, Pi2, Pi3 and PiZero.